Specialty CME Credits:: Included as part of the 4 credits, this CME activity is eligible for 4 Trauma CME and 0.5 Pharmacology CME credits, subject to your state and institutional approval. 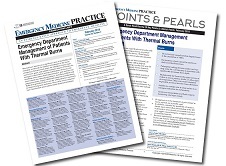 Thermal burn injuries are a significant cause of morbidity and mortality worldwide. In addition to treatment of the burns, emergency clinicians must assess for inhalation injury, exposure to toxic gases, and related traumatic injuries. Priorities for emergency resuscitation include stabilization of airway and breathing, intravenous fluid administration, pain control, and local wound care. Special populations, including children and pregnant women, require additional treatment considerations. Referral to specialized burn care for select patients is necessary to improve long-term outcomes. 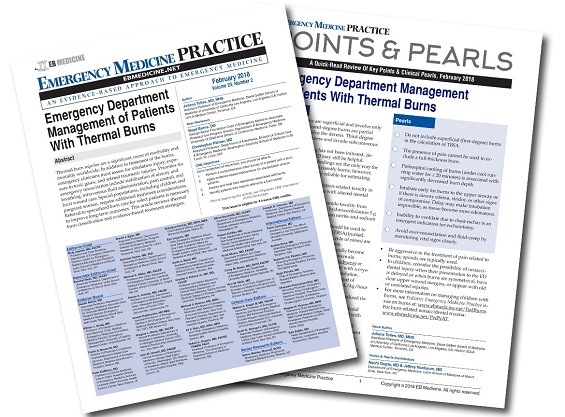 This article reviews thermal burn classification and evidence-based treatment strategies. I will start using the Lund and Bowder chart rather than Rule of Nines to estimate TBSA. Great article! I will start using Lund & Browder for calculating TBSA and will provide more aggressive pain management.